Learn how to purchase and install earthquake shut-off valves or excess-flow valves. An excess-flow valve (EFV) automatically closes and restricts the flow of natural gas in the event an underground pipe is damaged or if there is a significant increase in the flow of natural gas to the meter. If you want to have an earthquake natural gas shut-off installed, or are required to have one by your insurance company or the local Department of Building and Safety, the valve must be installed on your house line. If installation requires natural gas service closure, you'll need to contact us to shut off the service and restore service when installation is completed. Natural gas service shut off and restoration of service orders can be scheduled by contacting us at 1-800-427-2200. When you hire a qualified professional to install your earthquake valve, you'll need to make sure that the valve is installed on your house line, not on SoCalGas' facilities. SoCalGas' facilities include all of the pipe fittings installed and maintained by SoCalGas, up to and including the last elbow or tee connecting to your house line. See the diagram below for to see where your house line starts. All unauthorized valve installations found on SoCalGas' facilities will be removed. In addition, earthquake valves are not permitted in utility curb meter vaults. If you have any questions about your insurance company requirements, contact your insurance company or agent. If an earthquake or other significant event causes your earthquake shut-off or excess-flow valve to close, you can follow the manufacturer's instructions for resetting the valve so that natural gas flows again. However, we recommend that you contact a qualified professional or SoCalGas to reset the valve, and to perform a safety check of your natural gas appliances before they are placed back in operation to verify that no natural gas leaks exist, and to re-light your pilot lights. Where to buy a valve: You can purchase an earthquake valve at supply retailers, licensed plumbing contractors, or directly from the valve manufacturer. Using a contractor: You can hire a qualified professional to install the earthquake or excess-flow valve on your house line. SoCalGas will not install a valve for you. Effective February 10, 2002, California Public Utility Commission (CPUC) Decision 01-11-068 prohibits installation of an earthquake valve on SoCalGas' facilities. In addition, SoCalGas no longer installs earthquake shut-off valves for its customers, and does not allow any customer owned equipment, including excess-flow valves, be installed on SoCalGas' facilities. If you have an earthquake valve that was installed by SoCalGas or one of its authorized contractors on or before the February 10, 2002 cutoff date, that is located on SoCalGas' facilities, with proper documentation your installation may be allowed to remain in place. Authorized contractors are those who participated in SoCalGas' earthquake program and were trained by SoCalGas to work on their facilities. Additional information regarding earthquake valves and natural gas service restoration after a valve activates can be found in Tariff Book, Rule 10, Section G, "Earthquake Valve Service." If you have questions about earthquake and excess-flow valve installation requirements, contact your local Building and Safety Department. An Excess Flow Valve, or EFV, is a safety device installed on natural gas distribution pipelines to automatically close and restrict the flow of natural gas in the event an underground pipe is damaged or if there is a significant increase in the flow of natural gas to the meter. These conditions are typically caused by digging or construction but can also be caused by damage to your natural gas meter by a vehicle impact. What does an EFV do? important to understand that an EFV does not shut off the flow of natural gas completely. Some leakage may still occur resulting in a hazardous condition. 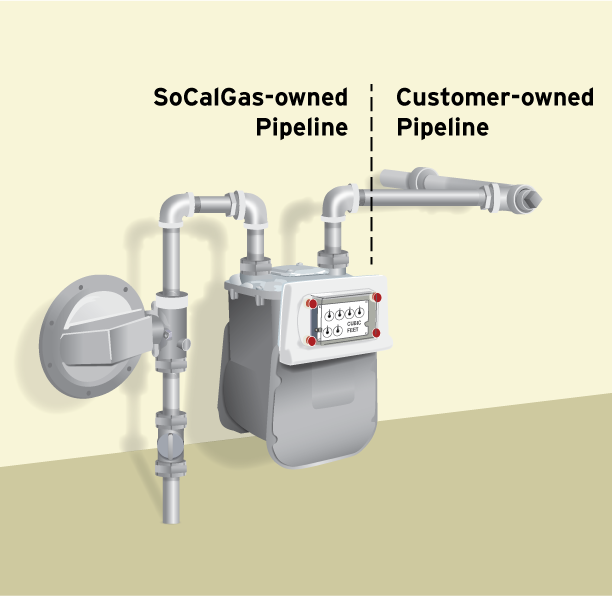 An EFV is installed on the service pipeline that runs underground between the natural gas main (usually located in or near the street, alley or easement) and the SoCalGas® meter on the customer’s property). The best way to prevent damage to a natural gas pipeline due to digging is to call 811, the Underground Service Alert program, at least two working days before digging. Underground Service Alert will coordinate with SoCalGas to mark the locations of buried utility-owned lines - absolutely FREE. If you are interested in having an EFV installed on the service pipeline serving you, please call SoCalGas at 1-800-427-2200. SoCalGas will first check to see if your service already has an EFV installed and, if not, an estimate to install the EFV will be provided. The cost to install an EFV can vary widely depending on site specific conditions and can range from $2,500 to $5,000 or more. If you decide to have an EFV installed, we will coordinate with you to schedule the installation (note that it is possible that natural gas service will be interrupted to install the EFV). The construction crew will dig around the natural gas line in order to install the EFV and when the job is complete natural gas service will be restored (if it was shut off). If paving or concrete needs repair that work will be scheduled at a later date. Terms and conditions apply, including but not limited to: Only SoCalGas or its approved contractors may perform the EFV installation. If the natural gas service exceeds 1,000 Standard Cubic Feet per Hour (SCFH) or one or more of the following conditions are met, an EFV will not be installed: (1) the service line does not operate at a pressure of 10 pounds per square inch (psi) or greater throughout the year; (2) SoCalGas has prior experience with contaminants in the natural gas stream that could interfere with the EFV’s operation or cause loss of service; (3) an EFV could interfere with necessary operation or maintenance activities; or (4) an EFV meeting applicable performance standards is not commercially available.